Long Semadoh has a Homestay rooms catering for anyone who loves a quiet and cool surrounding, who loves mountains and fast flowing streams. Those who love nature, Long Semadoh is the place. Imagine lying down in the clear water stony river for hours! Imagine sweating it up along mountain path to Wat Gerawet for about 1 and a half hour or to Buduk Balud Prayer mountain for about an hour walk. Stroll along the paddy fields or look for some buffaloes in the semi grassland surrounding. At night is quite cool, more than aircon. so you don’t worry about comfort. Bring thick cloth for the night. In Long Semadoh, the imediate surrounding is just like a golf course. There will be paddy fields and secondary forest and the mountain forest. There are also some ancient crocodile mounts with histories. if you are a Christian, go and join the early morning devotion at about 430am, you will hear the bamboo bell. The people of Long Semadoh had decided to erect memorial stones for some important sites in Long Semadoh. One is near Punang Trusan, where the missionaries were hidden by the Lun Bawangs during the Japanese Occupation, and another one, by the river at Long Semadoh where the late Pendita Meripa ( Alan Beltcher) and his wife, Pendita Ganit stayed for about 10 years. Any assistance for this projects can be made through the designated people. 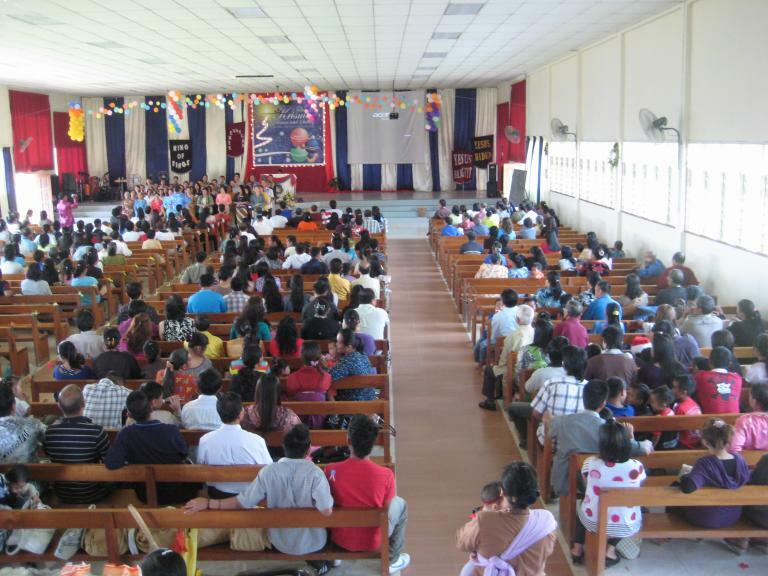 The new church building in Long Semadoh Rayeh, which can accommodate more than 1000 people. Long Semadoh A is a well known village about 100 kilometres from Lawas town. It’s cool climate, especially at night makes sleeping comfortable. It is a peaceful place and the people are all Lun Bawang. Most of the older generation had left for heaven for being the first generation of believers in Christ. During those years, from 1948 to 1975, this place was regarded the most hospitable place ever visited by outsiders. No quarrel, no theft and no immoral activities. You won’t find people who spoke or drink strong drink! Every one goes to church on sunday. Even to this day, we seldom see people involved in undiserable activities. One missionary prayed over Long Semadoh many years ago so that the village will be an example to the surrounding villages. 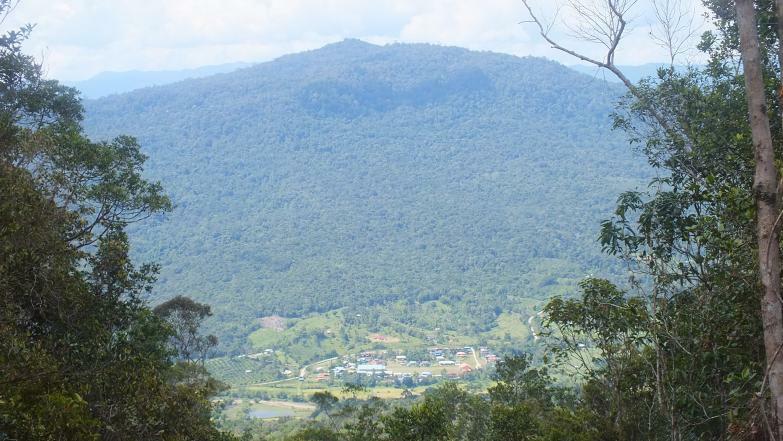 Long Semadoh comprise of 6 villages, namely Long Semadoh Rayeh or A, Long Semadoh Naseb (B), Long Telingan, Punang Trusan, Long Tanid, Long Beluyu and Long Kerabangan. It is historically well known as far as Sarawak History is concerned. Vyner Brooke, the Third Rajah of Sarawak did led an expeditionary force to the highland, to fight the rebellious Lun Bawangs there. It became famous when it was regarded as the cleanest village in Sarawak during the Brooke rule, after it was considered as one of the dirtiest before the missionaries set foot there. Lun Labu’ was the earliest settlers there before the Kemalohs joined them there. At a later date, some of the Kemaloh Lun Bawang migrated from the Kemaluh river of Kalimantan to Ba Puek, at Long Semadoh B. This group was led by Ukung Kelupan. Other historical figure is Bian Murud, at Pa Adang. A group from Pa Adang, a tributary of Limbang River, moved to Long Kerabangan. The current headman of Long Semadoh A is Padan Ating. His father was formally the head man too. Long Semadoh had a rich history. In fact, in the seconday jungle around it, you can find some crocodile mounds and some historical stones. These speak volume about the old customs of the people before Christianity. Long Semadoh A is the major settlement there. It has a population of more than 500 people, of which some are working in the towns or cities. Formally, it had a primary school in its vicinity. The primary school then, was quite big, and even had peace corps from USA teaching there in the 60s. We had a very good library then, and i read the classic stories such as “treasure islands and Robinson crusoe ” there. Students from Ba Kelalan and Long Luping used to go there to finish their primary six. Eventually, it was moved to where it is now, an the abandoned airfield, about 3 kilometres away. Trusan river flows nearby, making it a nice place to bathe or swim. A golf-like field surrounds Long Semadoh A making it beautiful and clean. Long Semadoh A is in a valley. To the east is the mountain range of “Wat Gerawet.” Wat means roots and gerawet means intertwine or interlock. To the west is the famous mountain of Buduk Balud. Balud is a type of wild pigeon while Buduk is the top of a mountain or house. Buduk Balud slopes were cultivated in the old days. There were some Long Houses there too. The paddy fields are along the river basin, and the people just walk to their paddy fields easily. They also have buffaloes in the laman. Almost at the centre of the village is the church building and the football field. This is the central building where worship activities are held. A missionary couple, Pendita Meripa and Pendita Ganit stayed in Long Semadoh for a very long time. They were well verse in the Lun Bawang language. They helped to translate the English Bible into Lun Bawang while there. An Easter celebration was once held at Long Semadoh in 1948. Earlier on a missionary named Pendita Balang prayed over Long Semadoh so that it would remain a strong community of the Lord. The earliest Penghulu, Ating Mugang was from this village, before the the penghuluship was passed to the grandson of Ukung Kelupan, Langub Pengiran. Now the penghuluship is bestowed to penghulu Muga at Long Semadoh B. There are some important individuals from this place. A lady by the name of Mariam Ukul will not be forgotten by all the younger generation of Long Semadoh. She was the sunday school teacher for a very long time ( more than 30 years). Another one is of course Meechang Tuie, who was the longest serving president of Sarawak Lun Bawang Association. He served for 10 years before stepping down. He is currently the first Lun Bawang secondary school principal, a graduate of the university of London. There are some other university graduates in Long Semadoh A too. Most of them had gone home to heaven to be with the God of whom they had so faithfully served. Only a handful of them are left. Some hardly can walk but their hearts for God had never changed. In fact they are waiting to go to have a reunion with their love ones. These godly first generation Christians are the reason why Long Semadoh is not overrun by evil forces of the world. Their prayers and their presences prevent the world from occupying the strong hold of the early Christians. But we can see that some young people are trying to bring in alcoholic drink and fags and the world life style and if the Christians do not pray hard, Long Semadoh will fall into the hands of the unseen forces and life that the first generation Christians had defeated and chased away. Unbelieving young are growing in numbers, when i say unbelieving, those who never go to church and who has no fear of God in their life. The second generation like my group must carry on the struggle to keep Long Semadoh as a holy ground for the glory of God. Long Semadoh has a cool surrounding. The Trusan valley offers the inhabitants a rich soil for paddy farming. The forest or jungle, although mainly seconday forest covers the hills and mountain slopes, giving the place a truly natural setting. There is no other activities like what you find in the towns some 100 kilometres away. The village is about 3000 feet above sea level. The Trusan river, is a fast flowing river coming from the mountain range close by. Since timber companies are not encroaching its jungle, the people living along the Trusan Valley from Puneng Trusan, Long Telingan, Long Semadoh A and Long Semadoh B, Long Tanid, Long Beluyu and Long Kerabangan enjoys this clear water river. The villages up to Ba Kelalan too enjoy the same natural surrounding. With the new mountain road that the Malaysian army built up there, the villagers can travel quite easily among the villages there.